Western Forest Products’ Saltair sawmill produces upwards of 215 million board feet of high value lumber a year, and the Vancouver Island sawmill will now be doing that more efficiently, thanks to a recent $38 million upgrade (Photo of Saltair mill by Paul MacDonald). A new safety tool is now available to sawmills and wood processing plants, with the release of a sawdust audit standard that was developed by the major lumber manufacturers in B.C. The $38 million upgrade of Western Forest Products’ Saltair sawmill on Vancouver Island is allowing the mill to more efficiently produce lumber now—and positions it well for the future. The next generation of the Gordon family—a trio of brothers— is learning the ropes at Alberta’s Dean Gordon Trucking, ready to make their own mark in the logging business. Canfor is celebrating its 75th anniversary this year, and the company’s employees at its Elko, B.C. sawmill have further reason to celebrate, with a $40 million upgrade at the mill. B.C. custom cut mill operation S & R Sawmills is finding that investing in new Cat wheel loaders is paying off, in reduced fuel costs. Owner/operator Scott Pilkington is a specialist contractor, focusing just on log processing, and is keeping busy these days with a new set-up, a Log Max 7000XT mounted on a Hitachi Zaxis 210 Forester tracked carrier that is delivering versatility and performance. B.C. forest industry veteran Brian Leslie has had some interesting experiences and adventures since moving to India last year as a technical advisor for B.C.’s Forestry Innovation Investment Ltd. Included in The Edge, Canada’s leading publication on research in the forest industry, are stories from the Canadian Wood Fibre Centre, Alberta Innovates - Bio Solutions and Alberta Agriculture and Rural Development. 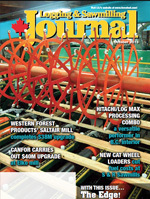 Logging and Sawmilling Journal looks at harvester/processor heads in this issue’s Tech Update. It was a happy group of employees who attended a pancake breakfast hosted in June by Canfor in Cranbrook, B.C. 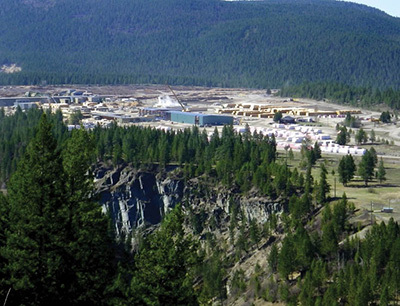 for its Kootenay region mills—which included its upgraded sawmill in Elko, B.C.—celebrating the forest company’s 75th Anniversary. And while the maple syrup and butter on the pancakes tasted sweet, sweeter yet for the 190 Elko sawmill employees was the sound of construction equipment working on a $40 million upgrade, to completely modernize the mill. Since Don Kayne was appointed President and Chief Executive Officer (CEO) of Canfor in February 2011, B.C.’s largest forest company—with 5,500 employees— has quickly become the dominant force in the East Kootenay region, located in the largely mountain pine beetle-free southeast corner of the province. In 2011, it reopened its sawmill in Vavenby and spent $24 million to modernize the mill, followed by reopening its sawmill in Radium and spending a further $38.5 million on modernization, including an entirely new planer mill. Canfor then purchased the Tembec sawmills in Canal Flats and Elko and announced another $40 million refurbishment for the Elko facility. All told, between 2009 and 2013, Canfor has spent $600 million on its facilities in British Columbia, and created hundreds of jobs. Reopening the Vavenby and Radium sawmills alone created 305 direct jobs. So when it came time to celebrate a significant anniversary like the company’s 75th, there was plenty to celebrate, and the company did, with all sorts of events held this past summer in many facilities. With modern facilities featuring some of the most advanced equipment available, such as computer grading systems in the planer mill, and with a marketing focus strongly leaning toward producing higher value products tailored to specific customer needs, company founders John Prentice and LLG (Poldi) Bentley would no doubt be pleased with the direction the company is headed. The brothers-in-law fled Austria as war loomed in Europe and settled in Vancouver. In 1938, they started Pacific Veneer, a furniture and paneling company, with a small mill on the Fraser River in New Westminster, employing 28 people. Within a year, the company had 1,000 workers and was supplying plywood for aviation and marine applications—including World War II Mosquito Bombers. Today, the company has grown into a major global supplier of wood products, and the Elko sawmill is positioning itself to become a big contributor to the company’s product mix. Once the investment in the sawmill and planer mill are complete next spring, the Elko facility will produce about 260 million board feet annually, which is about one-third more than it produced prior to the modernization. The sawmill produces lumber from 2 X 4 to 2 X 10, from eight to twenty feet in length. Starting this year, the Elko mill switched to processing entirely cut-to-length logs, which average from 4” to 18” in diameter. Chabot says the focus at the sawmill is not only on greater recovery but also on better grade outturn. This is largely in response to strong customer demand for lumber free of beetle defects such as blue stain. What drew Canfor to investing significantly in the Kootenay Valley was the quality and variety of timber in the region. The fibre mix consists of spruce, pine, balsam, hemlock and cedar—and, importantly, that is green standing timber. The Elko sawmill predominantly processes pine. Canfor is capitalizing on the high lumber quality it can produce from the region by adopting a ‘Canfor RED’ marketing strategy, identified by distinctive red lumber wrap used for bundles leaving all three Kootenay mills—specifically, Elko, Canal Flats and Radium. The lumber produced at Elko is sold in the United States and Japan. About 20 per cent of Elko sawmill production is J-grade material. Starting on the front end of the sawmill, Chabot says making the transition to CTL log processing will result in greater recovery and productivity in the sawmill, as the logs are transported into the yard already sorted by diameter. Part of the investment in the sawmill portion of the site was to install the necessary sorting bins at the front end to accommodate CTL logs. The entire construction project, involving both the sawmill and planer mill, was handled by the BID Group of Companies, based in B.C., and specifically its Nechako Construction division, which installed all the required structural steel. The sawmill has two processing lines: one featuring an older residual twin (RT) canter for larger logs and the other an Optimil canter line with installation of a new Optimil profiling gang, which delivers in-line profiling of the top and bottom boards and improves production rates. The RT canter line is being replaced with a Comact DDM6 small log line, which Chabot says will allow the sawmill to process smaller logs more quickly. After primary breakdown, the lumber is further processed through a Newnes board edger. It proceeds past a Newnes scanner, and then is positioned using an SEC paddle fence in advance of the Newnes trimmer, before ending up in the Newnes sorter bins and stacker. The Elko sawmill is improving its kiln drying capacity as part of the modernization by adding two Deltech dry kilns, and a major portion of the overall $40 million investment is for a completely new planer mill. The equipment installed in the planer mill starts with an SEC tilt hoist, with lumber feeding into a high speed, six-roll Gilbert planer. The planer uses pull-through technology, which Gilbert says prevents overlapping and breakages in the machine. It also comes equipped with the company’s automatic positioning system, to control the cutter heads. The planer operates at 2700 feet per minute. After the planer, the lumber is graded using a completely computer-based grading system, the Comact GradExpert. It then proceeds to a Comact trimmer, two sorters and two stackers, one supplied by Comact and the other supplied by SEC. The Comact trimmer has the cut-in-two option, which allows Canfor to use the GradExpert data to cut individual boards in two should part of the board have a higher grade rating. “The investment in the planer mill will definitely improve recovery as well as productivity,” says Chabot, with the production goal being 60,000 board feet per hour. A new Signode bander was added at the back end of the planer mill to complement the existing unit, and Deltech supplied the paper wrapper. Canfor has also invested in all new mobile equipment in the Elko yard. Chabot says the overall investment does offer more stability for the sawmill’s workforce because it provides the facility with the ability to capitalize on the value of the local fibre source and therefore provide it with the strength to operate in a wider variety of market conditions. The sawmill operates 10-hour shifts, Monday through Thursday on a two shift basis, which is a change from operating three shifts Monday through Friday, 24-hours per day. The staffing complement has remained largely the same since Canfor’s purchase. Manual graders who found themselves made obsolete by the computer-based grading system were offered other positions in the company. Employees come from a fairly wide area, with 30 per cent commuting from Cranbrook, 30 per cent from the Fernie/Sparwood area, and the remainder from smaller rural communities in the vicinity of Elko.